Elderly Indian Man and Family in Need of Help! Sureshbhai Patel, 57, had recently arrived to the United States to help his son and daughter-in-law care for their 17-month-old child. Less than a week later, Patel was approached by the Madison Police Department in response to a suspicious person call. Sureshbhai, who does not speak English, struggled to communicate with the police. In an attempt to search him, Patel was forced to the ground by an officer and severly injured (left partially paralyzed). Patel underwent surgery the next day at Huntsville Hospital where doctors performed a cervical fusion. Sureshbhai faces a long recovery and is only beginning to regain feeling in his arms and one leg. The family has hired a local attorney to sue the Madison Police Department. The funds raised will be provided directly to the family to help cover the costs for hospitalization, PT, OT, and other therapies which will be huge out-of-pocket expenses. And while legal action against the police department is being taken, it may be years before Sureshbhai and his family are adequately compensated not only for his physical injuries, but their pain and suffering. The immediate costs to help the family help Sureshbhai recover, however, cannot be deferred in the hopes of any legal settlement. (Aakash) - I'm a member of the Indian community supporting this cause. I've spoken directly with Hank Sherrod (family attorney) and Chirag Patel (the son of Sureshbhai) to get approval for starting this Go Fund Me. All donation withdrawals from the Go Fund Me will be managed by the family of Sureshbhai -- I can not personally authorize or request any withdrawals from this campaign. Please reach out directly if you have any questions, thank you for your support. The family of Mr. Sureshbhai Patel would like to express their heartfelt appreciation for the ongoing support provided over the last few weeks. While Mr. Sureshbhai Patel still faces a challenging road to recovery, he has made significant progress in the recent days. With the help of the global community, this GoFundMe was able to raise over $209k – these funds will support the medical and medical related expenses incurred as a result of this tragic injury. “Mr. Patel and his family are very pleased by the prompt and decisive action of U.S. Attorney Joyce Vance and the federal grand jury. For the public to trust police officers, it needs to know officers will be held accountable, and the felony civil rights charges filed against Parker, unlike the misdemeanor assault charge being pursued in state court, more accurately reflect the seriousness of Parker’s conduct. Thank you once again for all the support and please keep Mr. Sureshbhai Patel in your prayers. 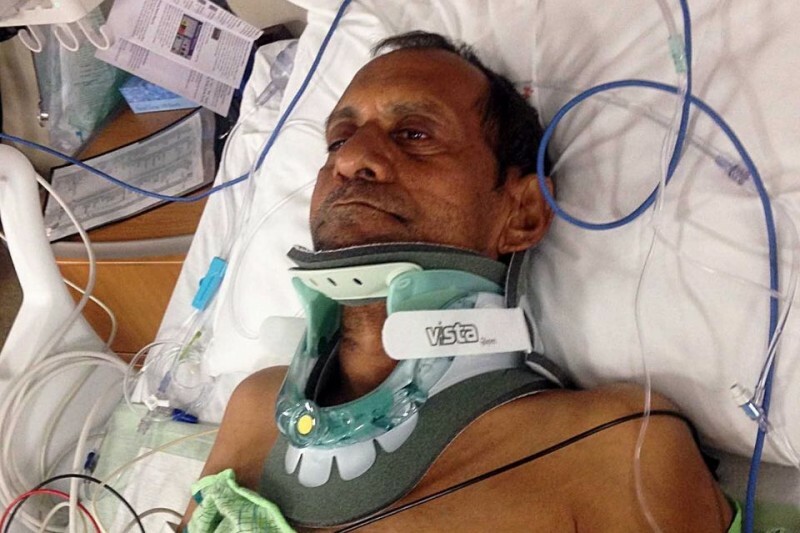 "I deeply regret the unfortunate use of excessive force by the Madison Police Department on Sureshbhai Patel and for the injuries sustained by Mr. Patel. I sincerely hope that Mr. Patel continues to improve and that he will regain full use of his legs." With the approval of the family and lawyer, a Get Well Card campaign has been organized by a supporter in Seattle. Feel free to send Sureshbhai a note wishing him well and showing your support for his recovery at the following address: Mr. Sureshbhai Patel, Health South Rehabilitation Hospital, 107 Governors Drive, Huntsville, AL 35801. 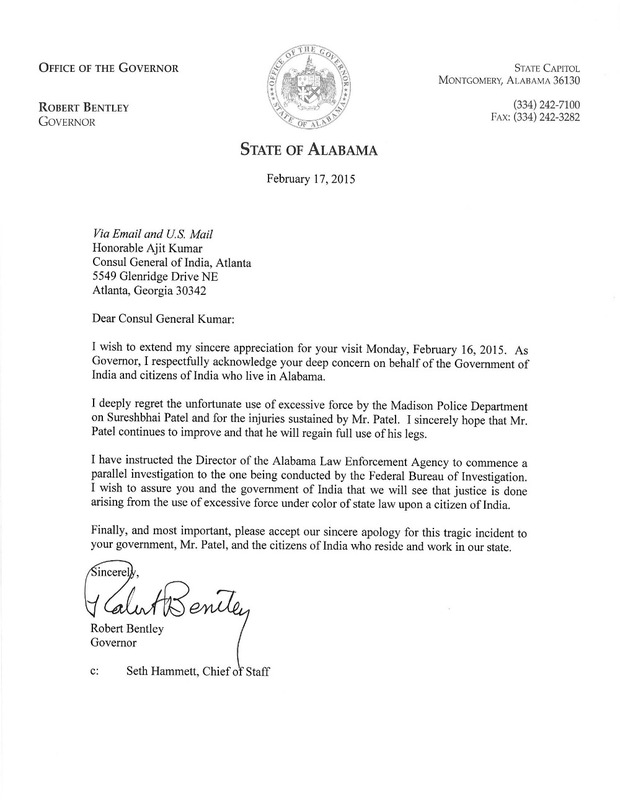 Thank you for your support and please continue to share Sureshbhai's story. I want to thank everyone for their ongoing support, Sureshbhai’s family has expressed their gratitude during this difficult time. Hank Sherrod, the family lawyer, has stated that Sureshbhai is improving faster than expected. “His grip strength is improving, though he can’t yet handle small objects (like a spoon). His legs are improving, too, particularly his right leg. The doctors attribute the improvement to Mr. Patel’s hard work and motivation.” Sureshbhai is in the process of being transferred to a rehabilitation center. Sureshbhai’s family is currently trying to determine the medical or medical related expenses they will incur due to this tragic incident. The family has yet to receive bills related to the hospitalization. 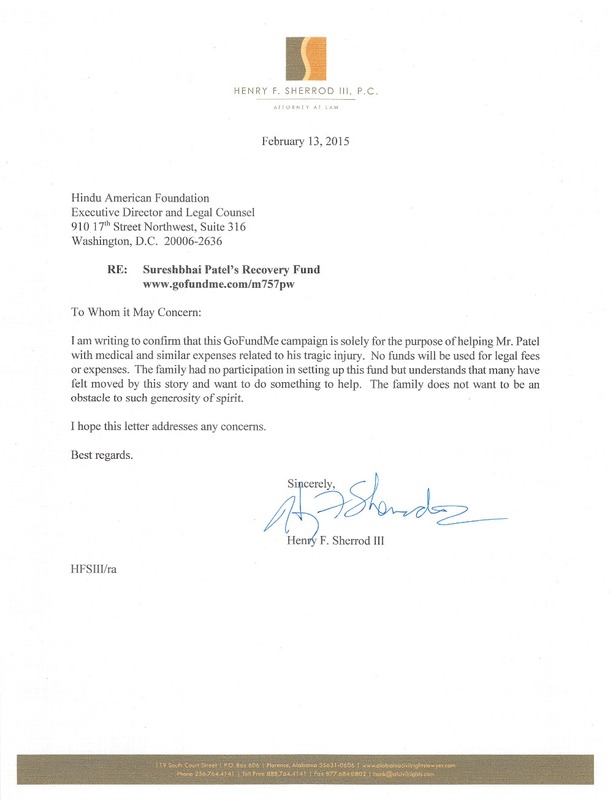 Please see the included image for the letter sent to the Hindu American Foundation (HAF) from Henry F. Sherrod III to verify the purpose of this Go Fund Me. As stated in the letter, the funds raised from this Go Fund Me will be solely for Sureshbhai Patel’s care and not for any legal fees or expenses. I hope you recover fully in body and spirit.